Harley-Davidson 110th Anniversary Parade | Hupy and Abraham, S.C.
Harley-Davidson celebrated 110 years of being America's favorite home-grown motorcycle. Part of the festivities was the huge, limited, parade through the streets of Milwaukee. Starting at the staging area at Miller Park, Home of the Milwaukee Brewers baseball franchise, the parade streamed through Milwaukee's streets culminating at the Summerfest Grounds on the Lake Michigan shoreline. If you were a part of the parade, maybe you can spot yourself or some people you know. If you weren't able to get into the parade or maybe not able to attend the party at all this past August 29-September 1, 2013, here's a glimpse of the parade in 4 video segments. View them here. Right up near the front of the parade in segment one is Cris Sommer Simmons, who rode her vintage Harley-Davidson, along with husband Pat Simmons of Doobie Brothers Fame, all the way from the Sturgis Museum to the Harley-Davidson Museum in Milwaukee; over 1,000 miles on a pair of motorcycles almost 100 years old. Hupy and Abraham, S.C. senior investigator, Tony "Pan" Sanfelipo and his wife Vicki, joined Cris and Pat in Columbus, Wisconsin for the last leg of their epic journey. There were many interesting individuals and groups from all over the world in this year's parade. Listen to Fox TV 6 Milwaukee newscasters as they describe some of the groups flowing past their observation point. Vicki Sanfelipo and her Women in Motion Road Guardians can be seen at the 9:25 mark in the segment two video. 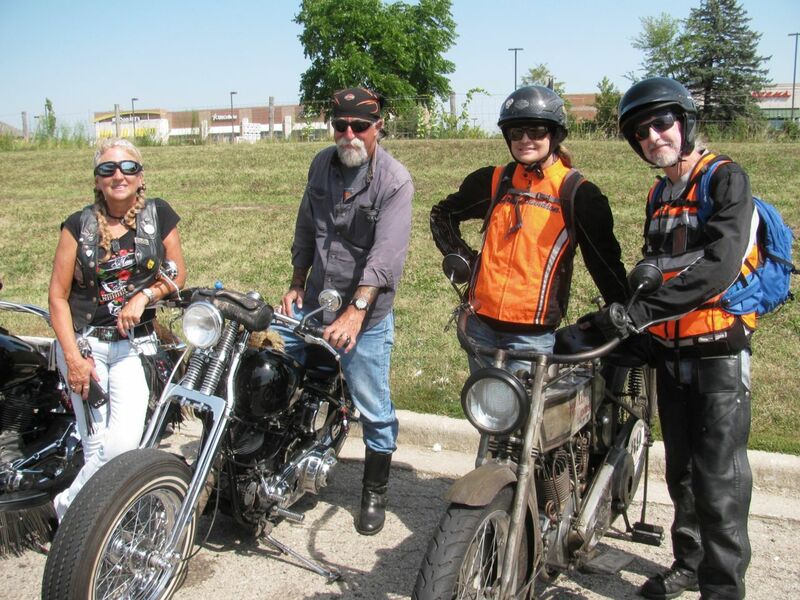 These women escorted a special Women's Ride on Friday, the day before the parade, that had 110 women from all over the world riding the scenic roads surrounding Milwaukee. They started from the Harley-Davidson Museum and toured the area near Holy Hill, ending at a famous restaurant on Lake Nagawicka near Hartland, Wisconsin.